When Merrily We Roll Along opened on Broadway in 1981, audiences didn't know what to make of it. The play's structure, moving backward from a cynical and depressing present to a time in the past filled with hope and optimism, must have seemed horribly pessimistic, as if the show's creators only wanted to twist the knife in the gut of America, reminding it of all it could have been and had failed to be. Seeing the show last night, in the wonderful production Dev Bondarin directed at the Astoria Performing Arts Center, I felt the opposite. This beautifully written play refuses to take away the charm and joy of youth, and the reverse chronological order makes the piece oddly optimistic. That might not have been apparent in 1981, but in a society surfeited on cynicism, wary from experience, but longing for something pure and true, perhaps this play can finally find a home. Collaborators Stephen Sondheim and George Furth based the musical on a 1934 play of the same name by George S. Kaufman and Moss Hart. When that show opened, almost 50 years before the premiere of the musical, the Great Depression was still raging. I imagine audiences must have been inclined to think harshly of the play's sell-out protagonist, whose path is traced back to the time he graduated from college, spouting self-confidently, "To thine own self be true." But the musical adds something vital... music! No matter how the audience might think about the play rationally, the music exerts an emotional force that resists the impulse toward cynicism. Traditionally, a musical will have a bright, happy version of a song in the first act, then a sad, melancholy reprise in the second. Merrily We Roll Along famously reverses this order. 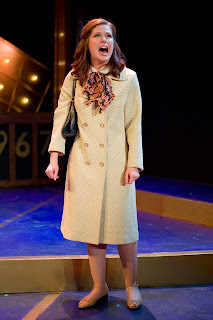 For instance, the character Beth (played wonderfully in this production by Rachel Rhodes-Devey) sings a horribly depressing version of "Not a Day Goes By" in Act I as she's going through a nasty divorce. Then in Act II, she sings the same song filled with love and joy on her wedding day. What is the effect of this device? One might be tempted to laugh at poor Beth, to deride her as a fool for ever having dreams. However, Sondheim's music won't let you. Watching the show at APAC, it wasn't as though I didn't feel the joy of Beth's wedding day. Instead, I felt the joy of her wedding day AND the pain of her divorce at the same time. I couldn't dismiss the joy, but rather wanted to hold on to it all the tighter. 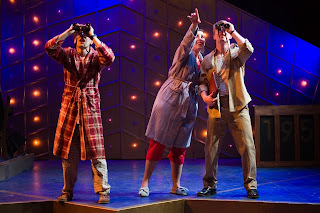 That goes double for the play's final scene, as the three friends who ultimately will tear each other apart share a magical moment on a rooftop watching the world's first satellite fly overhead. A moment in the past is not any less real, any less meaningful for having gone by. The emotions the characters feel, and that we feel, are still valid, even if they are doomed to dissipate and die. 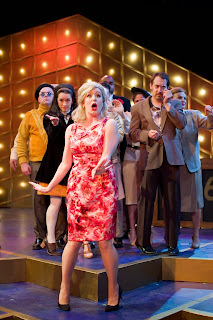 Merrily We Roll Along is playing at APAC until May 23rd, so be sure you get a chance to see it. 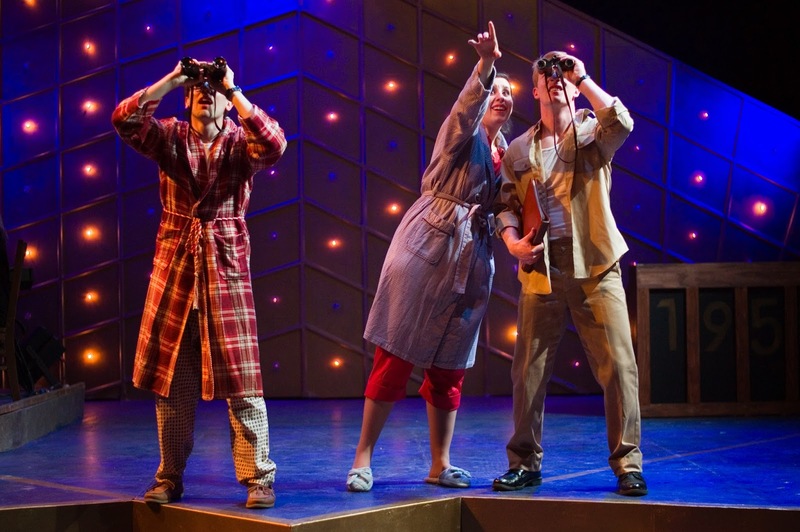 The central trio of composer Franklin Shepard, lyricist Charley Kringas, and novelist Mary Flynn are portrayed with pathos by Jack Mosbacher, Nicholas Park, and Ally Bonino respectively. Just be warned: You won't be able to get the score out of your head. In spite of what a certain producer in the play says, this show has plenty you can hum.